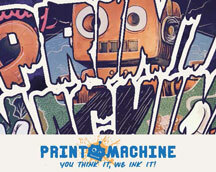 Print Machine is here to make your life more fun! From custom T-shirts, hoodies and apparel to coffee mugs, cellphone cases, stickers, posters, hockey pucks, coasters, giftware and promotional products plus so much more. We don’t limit ourselves to what we can print or decorate, so why limit yourself to the standard designs those other “custom” T-shirt and branding shops carry? We can even print on people with custom temporary tattoos! We use a mix of cutting-edge technology and tried-and-true methods to ensure we can put your logo, band name or message anywhere you need it to be. We stand by our slogan, “You Think It, We Ink It.” Whatever wild idea you’ve got for custom branded apparel, signage or promotional products, we’ll happily give it a try. All CSSC members will receive 10% off their custom team jerseys when ordering through Print Machine by mentioning you're a CSSC member! Go HERE to design your jerseys online. Going on a road trip to Edmonton? Check out their home store on Whyte Avenue located just South of Hudsons Canada's Pub at 8124 Gateway Boulevard. In this case, simply show your Membership Card for your exclusive deal!